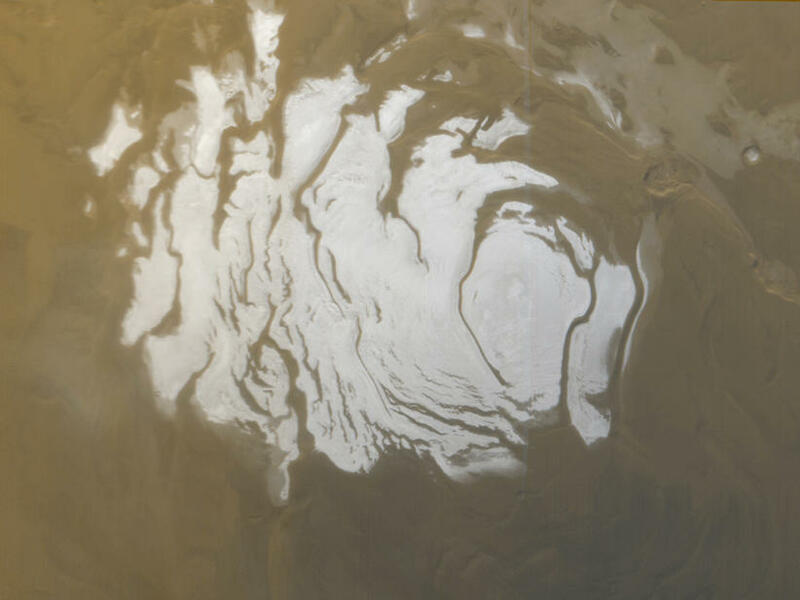 This is the south polar cap of Mars as it appeared to the Mars Orbiter Camera on the Mars Global Surveyor on April 17, 2000. An underground lake was found near here. Such radars are useful when searching for liquid water, "because water is a very strong radar reflector," he says. But Orosei and his colleagues knew better than to run right out and announce to the world they'd found liquid water on Mars. Remarkable claims that seem too good to be true frequently are. "After years, literally a couple of years of ... discussion, debate and let's say general head-scratching," Orosei says, "we really felt confident that any other explanation would fail." Or, he adds, paraphrasing Sherlock Holmes, "Once you exclude everything that is impossible, what remains necessarily has to be the truth." The water in the Martian underground lake is probably salty, otherwise it would freeze solid, even deep in the ground, Stofan says. And the salts are mostly likely made up of something called perchlorates, "which are very toxic to life here on Earth. But on Mars, who knows?" It's not clear where the water the Italian team found is coming from, and it's not certain there are any other underground lakes to be found. An Italian team of scientists says it has strong evidence for a subsurface lake of liquid water on Mars. It's a discovery that adds to speculation that there could once have been life on Mars, and raises the possibility that it might be there still today. NPR science correspondent Joe Palca has more. JOE PALCA, BYLINE: Making an exciting claim in science is a risky business. You attract a lot of scrutiny and face withering criticism if you get it wrong. Finding an underground lake on Mars is a very exciting claim. But Roberto Orosei and his colleagues say they have strong evidence. It comes from a European Space Agency spacecraft called Mars Express in orbit around the red planet. The spacecraft is equipped with ground-penetrating radar, which does pretty much what you think it does. ROBERTO OROSEI: Ground-penetrating radars use radio signals that are capable of penetrating into the ground and then get reflections from the material under the surface. PALCA: Orosei says such radars are useful when searching for liquid water. OROSEI: Because water is a very strong radar reflector. PALCA: From May of 2012 through December of 2015, the Mars Express radar mapped an area near the South Pole of Mars. When Orosei and his colleagues analyzed the data, they saw what looked like a lake of water about 12 miles in diameter and about a mile below the surface. OROSEI: And the material above it is all water, ice mixed with dust - the south polar layered deposits, as they are called. PALCA: Lakes beneath ice are not uncommon on Earth. There are hundreds of them, mostly in Antarctica. Orosei says he and his colleagues knew better than to run out and announce to the world they'd found a subglacial lake on Mars. Instead, they looked for something else that could explain what they were seeing. OROSEI: After years - literally a couple of years - of discussion, debate and, let's say, general head-scratching, we really felt confident that any other explanation would fail. OROSEI: Once you exclude everything that is impossible, what remains necessarily has to be the truth. PALCA: In other words, as they report in the journal Science, they say they really did find water. ELLEN STOFAN: I think this is extremely strong evidence that there is liquid water beneath the poles in this south polar layered terrain on Mars, which is extremely exciting. PALCA: Ellen Stofan was once a member of the Mars Express radar science team. But now she is director of the Smithsonian National Air and Space Museum. And why is this such an exciting finding? STOFAN: Liquid water is something that we're extremely interested in scientifically because life here on Earth evolved in liquid water. It stayed in the oceans for over a billion years. And so as we go outward from the Earth, looking for evidence of life beyond Earth, we're always looking for liquid water. PALCA: Stofan says the water in the subsurface lake is probably salty, otherwise it would freeze solid, even deep in the ground. And the salts are probably mostly made up of something called perchlorates. STOFAN: Which are very toxic to life here on Earth. But on Mars, who knows? PALCA: Although it's impossible to say for sure, Stofan agrees with Orosei and his colleagues that this probably isn't the only subglacial lake on Mars. STOFAN: It's likely that there are other pockets of liquid water like this under these layered deposits at the poles. PALCA: You can bet these new results will encourage others to look. Joe Palca, NPR News.